In the heat of summer, when the temperature climbs well past the point of comfort in a hot kitchen, the slow cooker that typically goes unused suddenly becomes a go to. And while this summer is unseasonably cool, my lemon balm has spread like mad, leaving plenty to spare for a simple summertime favorite. 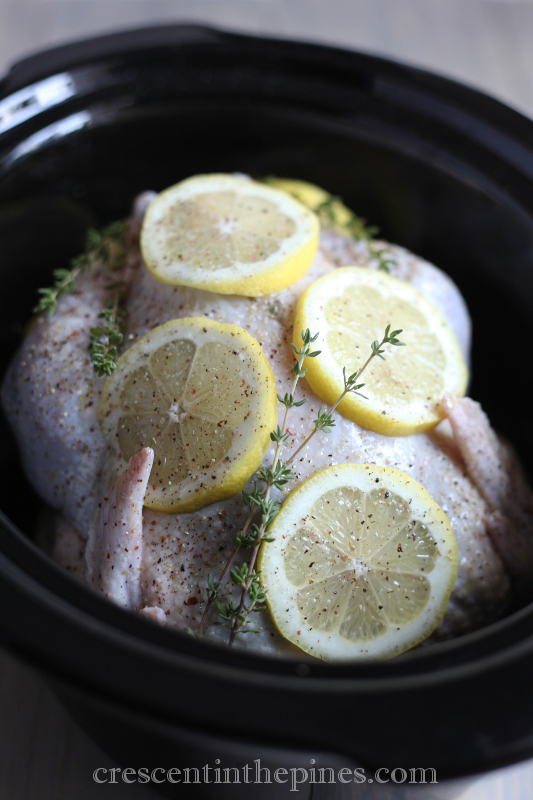 A play on the usual lemon balm and sage blends used on roast chicken, this relies solely on lemon balm and lemons for a delightfully citrusy lightness and the addition of garlic purely for a rich balance. None too heavily flavored, this chicken recipe is delicious on its own or ideal for pre-roasting chicken for future meals as the meat lends itself beautifully to other dishes. Set aside 1/3 of the whole lemon balm leaves. 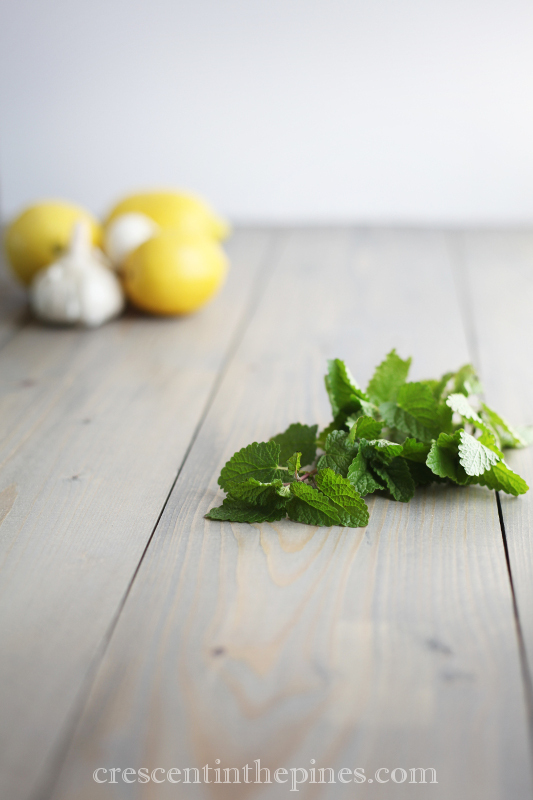 Chop the remaining lemon balm. Place the chopped balm and thyme, white pepper, and garlic powder into a mixing bowl with the butter. Remove insides from chicken, rinse chicken and pat dry. Loosen the skin of the chicken, and rub the butter mixture underneath the skin, over the breast and legs. Brush the outside of the skin with olive oil and sprinkle salt and pepper. Place the reserved balm and one garlic head cut in half into the cavity of the chicken, tie the feet. Cut remaining garlic heads and lemons in half and lay in bottom of slow cooker. Cut the bottoms off the lemons so they lay flat. Rest chicken on top of garlic and lemon halves. Cover top of chicken with additional lemon slices. Cook on high for 3 hours then reduce heat to low and cook until chicken is very tender and an instant-read meat thermometer inserted into the thickest part of a thigh, not touching bone, reads at least 160 degrees, 2 to 3 more hours. Optionally, the chicken may cook on low setting 6 to 8 hours. Slow cooker cooking times vary, so be sure to use a meat thermometer to check for doneness. Remove chicken and place in a 9×13 glass or ceramic baking dish. Place baking dish in the oven under the broiler for about 4-5 minutes, just until the skin darkens to a beautiful rich brown. Allow chicken to rest after removing it from the broiler for 5-10 minutes. Carve and serve.